A water district that serves an area of approximately 5,010 square miles and six counties in southeast North Dakota is on the verge of adding hundreds of new customers through a system-wide expansion project. This spring, Southeast Water Users District (SEWUD) held two successful bid openings for its Facilities and Pipeline Construction projects. The expansion process began in 2015, when SEWUD received $100,000 of funding from the State Water Commission to explore the feasibility of serving new users in its district boundaries. The study evolved into one of the largest expansions of a rural water system in the State. “The State Water Commission was looking for water systems with needs. They provided $100,000 for a feasibility study, and we thought maybe 150 users might sign up for the project,” says Brian Bergantine, AE2S Operations Manager and SEWUD Project Manager. Two years later, the system is on the cusp of adding 483 miles of rural pipeline to serve about 500 new users, as well as the city of Walcott by 2019. “It’s amazing how many people are really excited about becoming a rural water customer of this system,” says Bergantine. After consideration of the groundwater quality and the large amount of interest from potential users, SEWUD and AE2S kicked off a successful sign-up campaign. Sign-up forms were mailed to residents in the service area who were not already SEWUD rural water users. SEWUD placed ads and sent news releases to the local newspapers about the sign-up process. Nine public meetings were held throughout the district over a four month period to educate the public about the project, the benefits to potential users, and costs associated with the new water service. The meetings also provided an opportunity for SEWUD and AE2S to address any concerns from the potential users. “There was one woman who said she spent $90,000 trying to get water. She ended up with ‘wet water’ but she could not use it to drink,” Bergantine explains. Others said they had to take their clothes to town to wash them to keep them from being stained because of contaminants in the individual water supplies. Some talked about replacing fixtures and water heaters on an annual basis. One man even built a system to store water because his well only produced 50 gallons every day. Even with a working well, life can be hard if water is not treated properly. “Well water in this area often has high concentrations of iron and manganese and some have high concentrations of arsenic,” Bergantine explains. A study of 450 wells in the area was conducted with Superfund money in the mid-2000s. The results indicated that 82 percent of the wells tested were above the maximum contaminant level (MCL) for arsenic. Studies have linked consuming water laden with relatively high concentrations of arsenic over a long period of time to cancer of the bladder, lungs, skin, kidney, liver, nasal passage, and prostate, according to the U.S. Environmental Protection Agency. SEWUD is comprised of three older systems. The first rural water system in southeast North Dakota was installed in the 1970s on the easternmost corner in Richland County and was known as Richland Rural Water Users. It later changed its name to Southeast Water Users to more accurately reflect the system as it expanded into other counties. In the 1990s, two other systems (Ransom-Sargent Water Users and Dickey Rural Water Users) were added further west in Ransom, Sargent, Dickey, and La Moure counties. The three systems merged in January 2006. That merger created the current Southeast Water Users District, governed by one board with members from each of the three areas. When the systems were initially constructed, there were many different reasons why people did not sign up. “Some people think you don’t have to pay anything for well water, but it can be really expensive to keep a well running,” Bergantine said. Adding rural water to a residence will cost about $55 to $60 per month forvinfrastructure, plus the monthly cost of water usage. However, the cost of replacing fixtures and water heaters from hard well water can quickly make the cost of rural water pay for itself. The task of delivering high-quality water to a large area with few users is difficult. New pipes have to be installed or paralleled to meet the increased water demands. 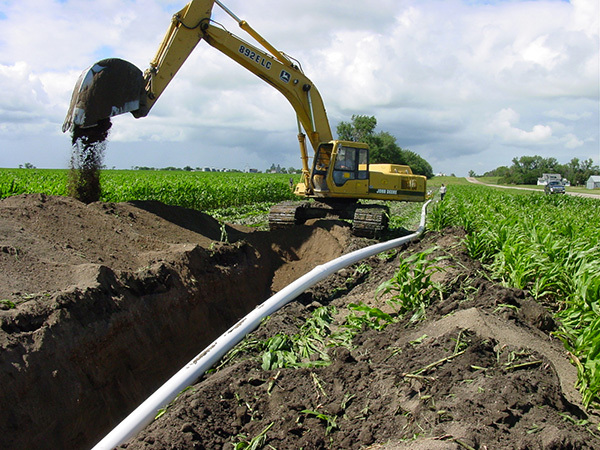 The feasibility of the project requires that there be at least one new rural user for every new mile of pipe installed. There are also pressure requirements, says Bergantine. Areas in the western service area needed a booster pump station between the water plant and a reservoir to ensure adequate pressure could be maintained to both the existing and proposed new customers. Not only will the system-wide expansion improve life in rural areas, it will also allow those communities to continue to grow and thrive. “You can order things online, even groceries, but if you don’t have good quality drinking water, that is a real quality of life issue,” says Bergantine. Even Julson, who grew up just to the east in Wahpeton, N.D., wasn’t aware of how many people were living without access to treated, drinkable water. “I didn’t realize that people were still using cisterns and hauling water from Fargo,” he said. In total, the SEWUD expansion project is expected to cost about $20.5 million. With $16.5 million secured from a combination of grants from the State Water Commission and loans, SEWUD continues to look for additional ways to fund the project.